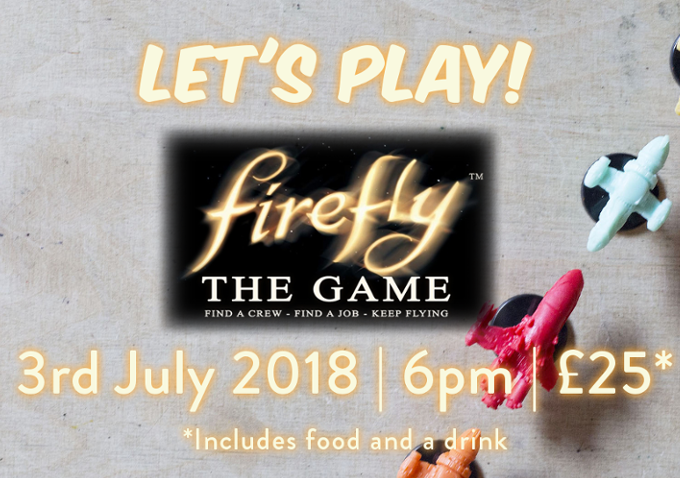 Our Let’s Play series of events allows customers to tackle an epic game during a single evening, with on hand expert advice and tuition by one of our friendly staff members, while being given a memorable themed setting in which to play! This time, we’re setting off into the skies as renegades, out to make the most money through questionable means while avoiding the cannibalistic Reavers; that’s right, it’s time to play Firefly! This game, based on the hit sci-fi TV show of the same name, will task you with looking after a ship and its crew while completing missions and taking cargo across space, while avoiding the authorities and the dangerous Reavers. All the while you are trying to outrace and trip up your opponents. Using characters and ships from the TV show, this game will delight fans while offering those who don’t know it a taste of the space western themes that this game relies heavily upon. Who will come out victorious? Our gaming expert will lead you through how to play the game and be around to answer any questions during the whole event, so you’ll never be stuck! Also, included in the price is some food from our artisanal menu and a drink from one of the many local breweries we work with so the whole evening is set. There are a limited amount of tickets available, so if you’ve ever wanted to see exactly what this incredible game is about, now is your chance!